This music includes theta frequency binaural beats to enhance its meditative and healing properties. An hour of comforting, sleepy music for meditation, deep relaxation and healing. This music is included in our Brainwave Bliss value bundle. Heaven and Earth is like a massage for the mind. This enveloping music will take you on a journey deep within yourself – releasing stress, soothing your nervous system and balancing your emotions. 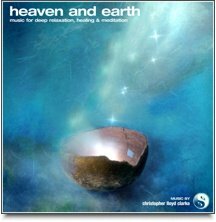 Heaven and Earth opens with an earthy, grounding tone – a sound that was created by stroking the strings of an acoustic guitar with a cello bow. This assertive sound quickly softens as additional instrumentation is introduced, but remains with you throughout the entire song. Oscillating synthesized sounds, Tibetan bells and gentle choirs all play their part in this deep healing music. "The first time I listened to it, after 10 minutes, I burst into tears. I didn't even realize I had things to be released, but I sure felt better! The second time I listened to it, I felt my angels working on me. I literally felt hands on me, moving through my energy field, and helping me heal a situation I was asking for help with. I brought the music into our center and a client listened to it as she received a mini-healing session. Afterward, her eyes were very bright, her skin was glowing and she said, "I felt like I was being worked on by my angels the whole time!" And her healing session didn't include a physical person working on her - she was lying on a bio-mat (a mat filled with sacred geometry and crystals). Then we played it all over our center. One of our practitioners said she felt very relaxed. (I didn't know she knew the meaning of the word!) Another one said she also felt someone working on her. A third one said she felt the energy of the center was raised by playing this music. If I had to describe the effects of this music, I would say, Heaven and Earth allowed me to relax completely, to let go of past pain easily and effortlessly, to connect more profoundly with the divine presence in my life, and to be a more perfect channel for that presence. All in all, I'd say this is a WONDERFUL piece of music. You are truly tapped in to the divine. Thank you again so much for sharing this." We recommend that you lie down and listen to Heaven and Earth with your eyes closed. Listen at a quiet volume and allow yourself to drift away. Please do not listen to this music while driving.